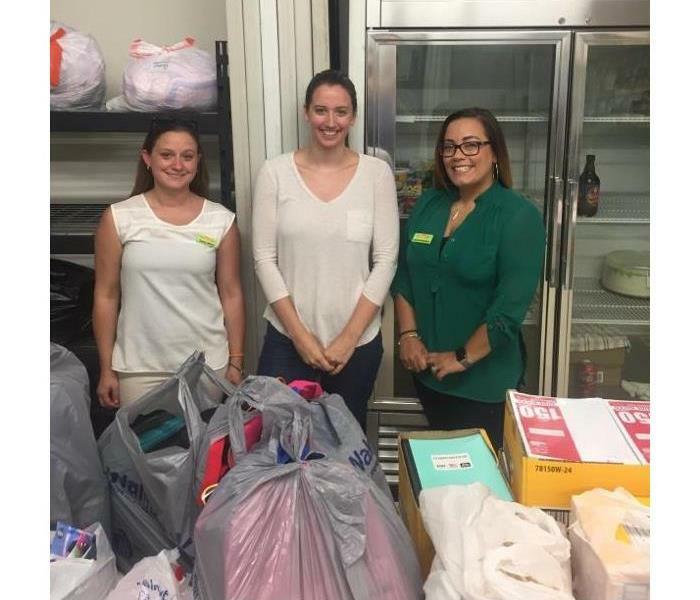 Every year SERVPRO of Charles County supports our community through The Childrens Aid Society. 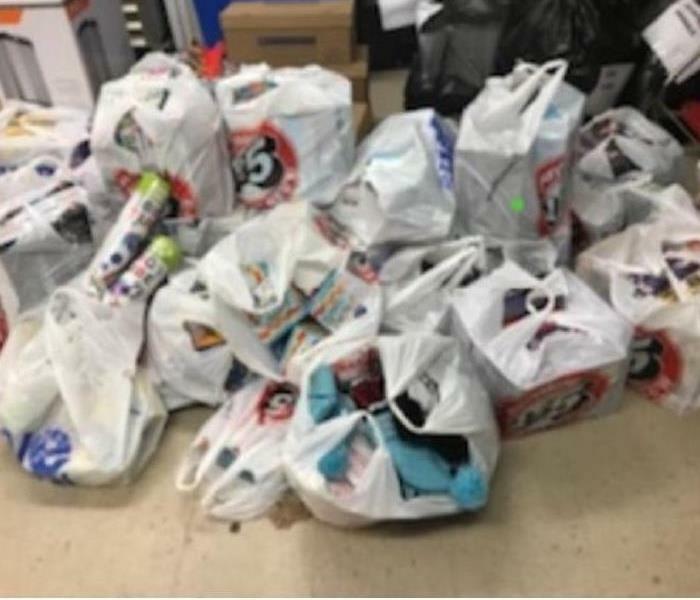 We not only volunteer our time but we also make toy donations to make sure that children in our community get to enjoy Christmas. We as a family believe that every little bit counts and anything we can do to assist is worth it! Working with the community to give back is vital to your sense of well being. Your community provides a place for you to live and work, so you should stop and ask yourself how you can give back. 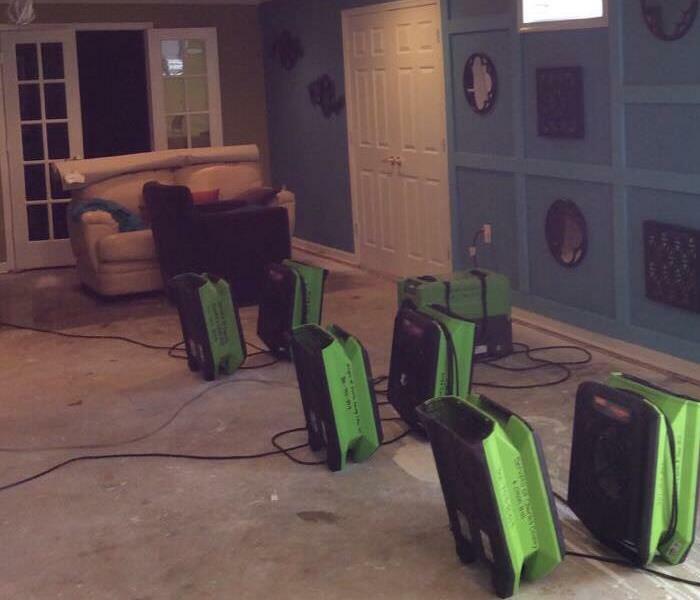 When you have a water damage it is important to call on highly trained professionals like SERVPRO. If a water damage is left untreated or not thoroughly dried it can lead to major issues down the line such as mold. Most people do not realize that after a fire there is residual damage caused by putting the fire out. Here at SERVPRO we believe in handling everything from top to bottom. 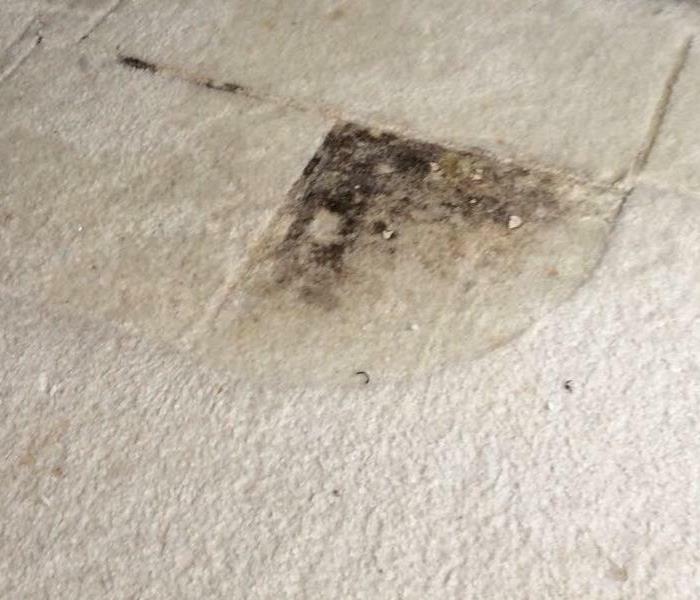 We will not only handle the directly affected areas we will clean everything including your carpets. When a fire occurs it is important to clean everything in a customers home because soot can do damage over time. 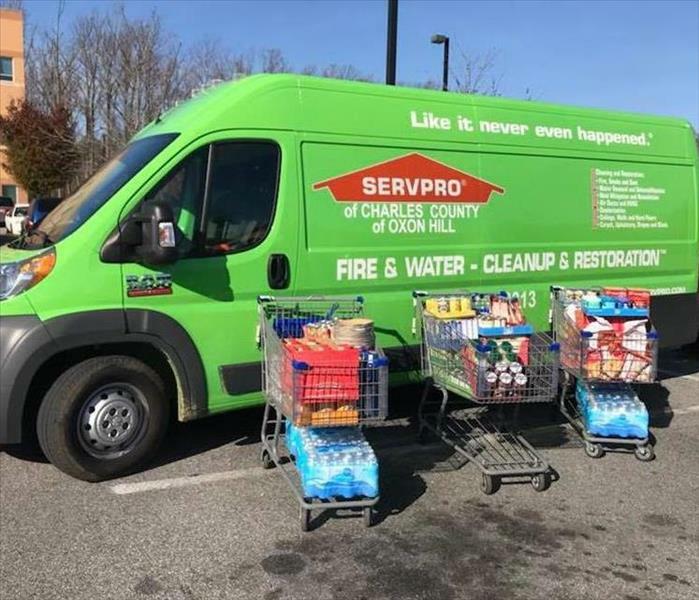 When SERVPRO is called to a fire we not only clean the directly affected areas but we clean EVERYTHING. 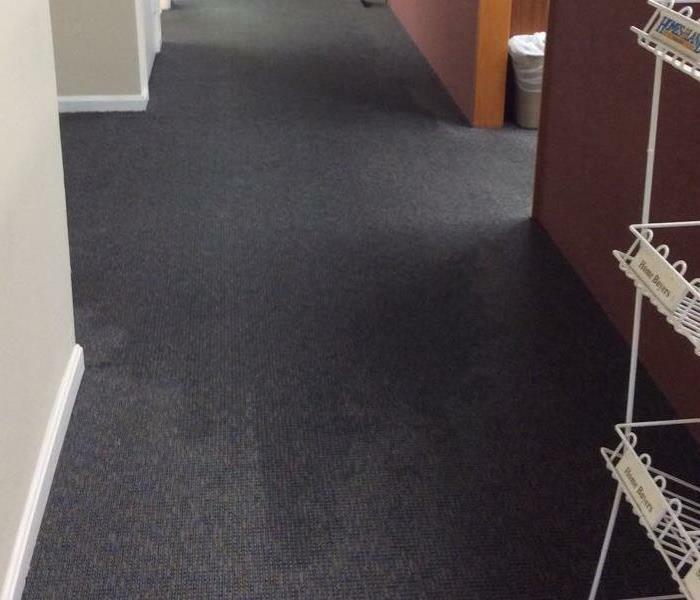 Water Damage in an office must be handled immediately by professionals to make sure that you get back to business. 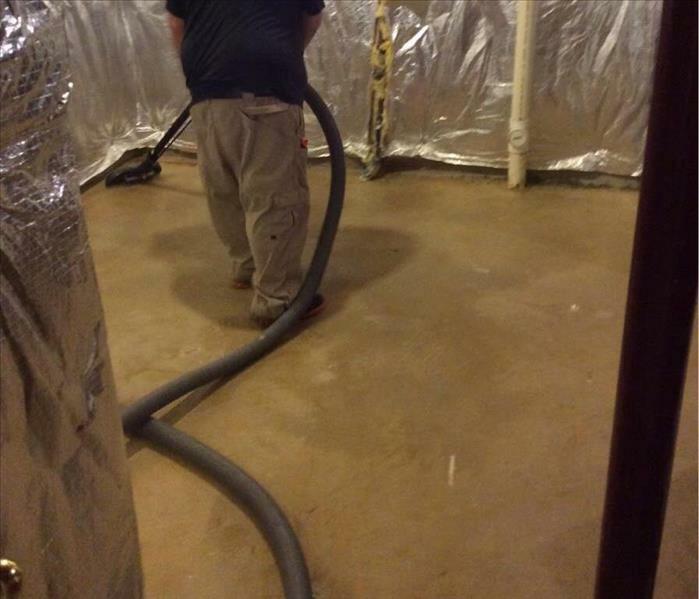 In this situation SERVPRO extracted the water and had to check the base flooring underneath the carpet. In the end we had to remove the carpet to ensure proper drying. 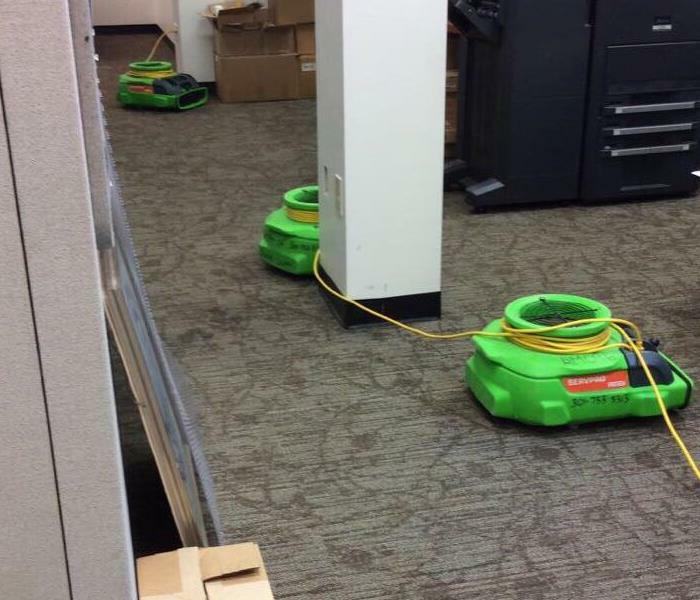 When a business has water damage it is very important to have proper drying equipment and techniques to ensure no future issues. 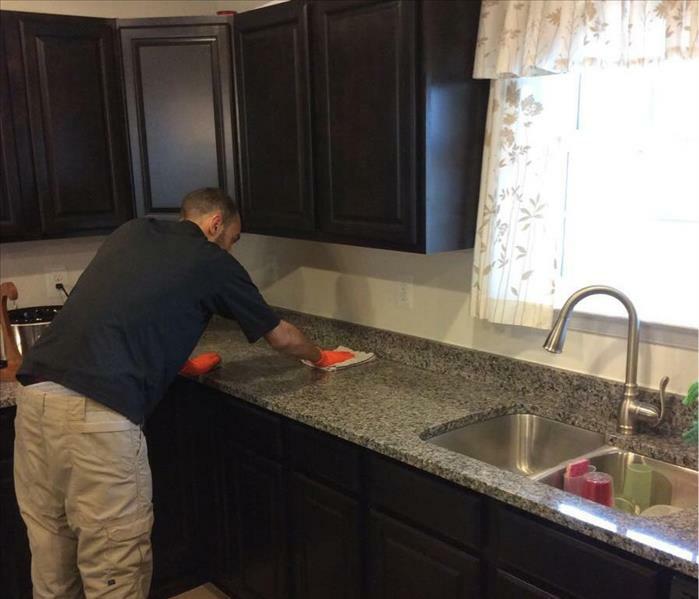 SERVPRO uses nothing but state of the art equipment and has highly trained professionals. When water damage occurs and it penetrates the flooring we must remove the flooring to ensure proper treatment and drying. This can be very costly if not done. Please always make sure to consult with professionals when a water damage occurs. When a storm hits you should always check your sump pump to ensure there is nothing blocking it. You should also listen for any different noises coming from your system. Sump pump issues can cause major damage. Mold does not have to be such a scary thing to hear for homeowners. The key to this is to have professionals act quickly to begin remediation. When dealing with professionals you should have piece of mind! In this situation the owner had extracted what they believed to be ALL of the water. They called SERVPRO as a precautionary measure and sure enough there was water UNDER the flooring. 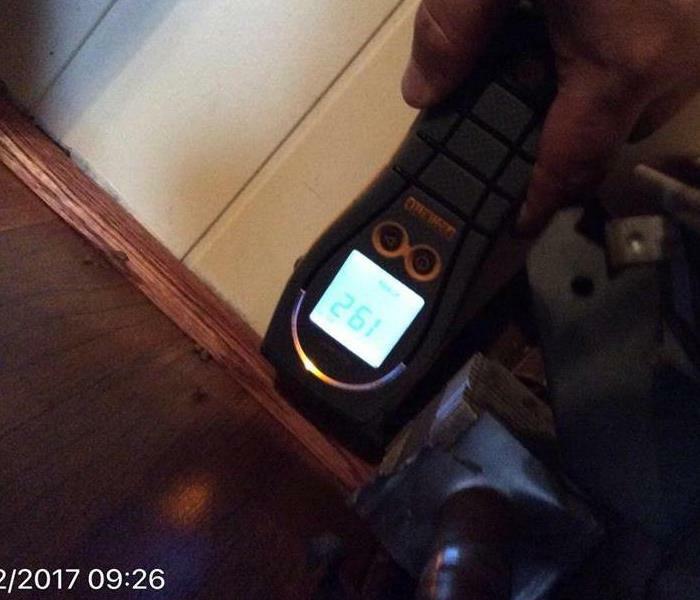 SERVPRO used our moisture meter to verify! 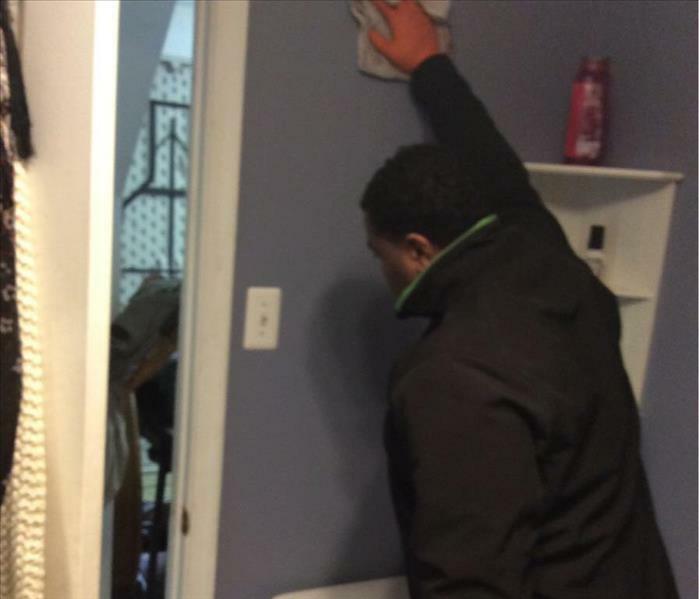 When a storm hits and water comes inside SERVPRO makes sure to extract all of the water before assessing the situation. This is another reason the training and certification of our employees is so important. When there is water damage on any surface SERVPRO is able to treat it. With our state of the art cleaner BENEFECT we can even treat concrete walls and kill 99.99% of germs. During an water damage it is imperative to make sure that we are treating the affected areas immediately. Unfortunately in most cases if there is carpet we will need to pull up the carpet and dry the material beneath. 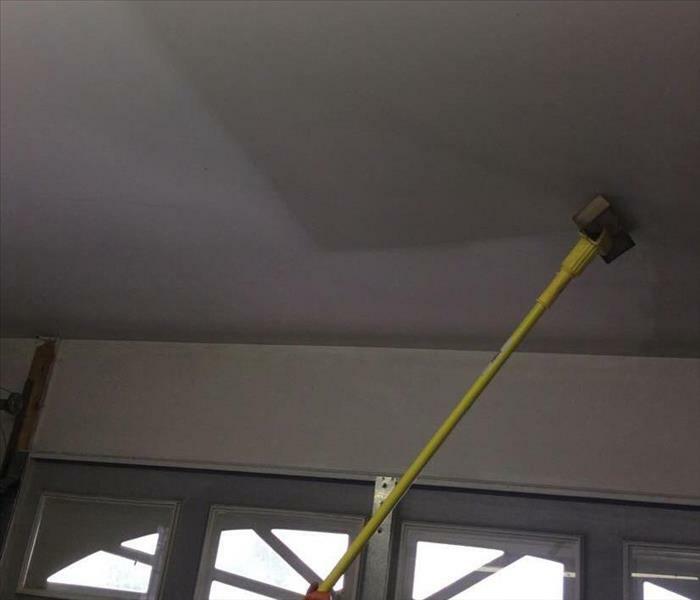 The location, severity and materials affected during a water damage plays a vital role in how long it can take to be corrected. 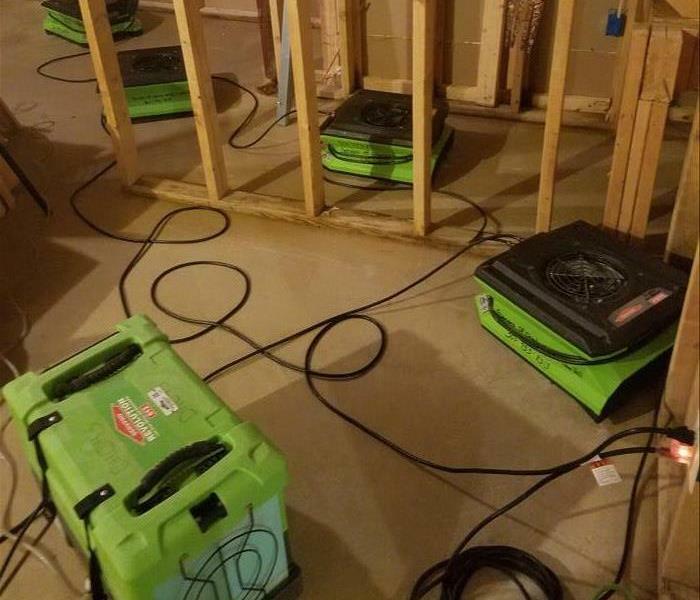 SERVPRO places state of the art equipment in the affected areas to dry and will check back frequently over the next 3-5 days or so to monitor. Water extraction is very important when you have water damage. SERVPRO uses state of the art equipment to ensure that we extract as much as possible so that the drying process can begin. 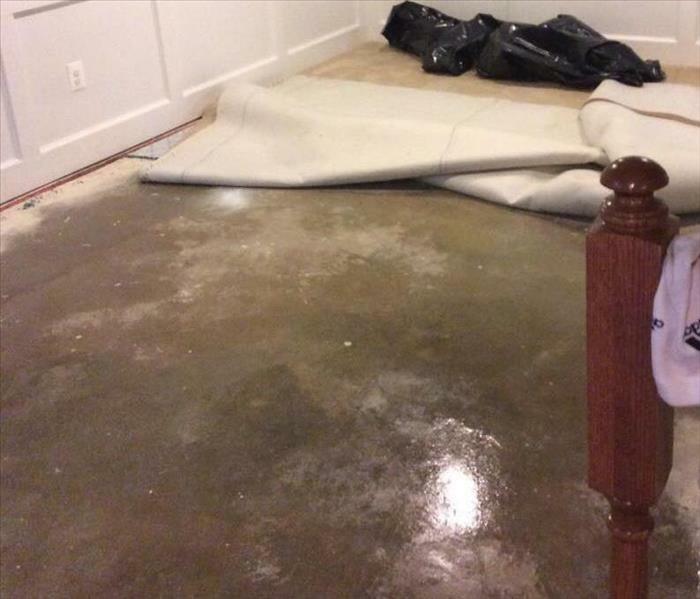 A rain storm can cause MAJOR damage in a basement when the sump pump backs up! Your Sump Pump should be checked regularly to ensure there is nothing blocking the drainage. 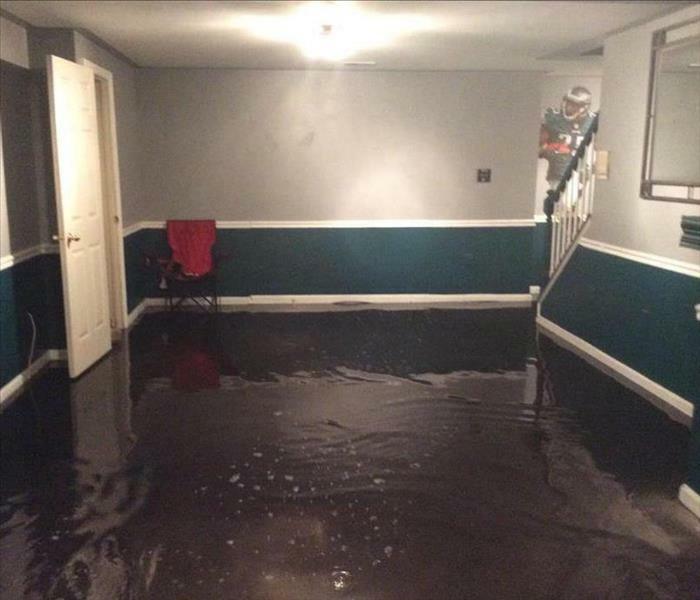 In this situation the ENTIRE basement flooded and flooring (Carpet, laminate, tile and wood base), walls and furniture. 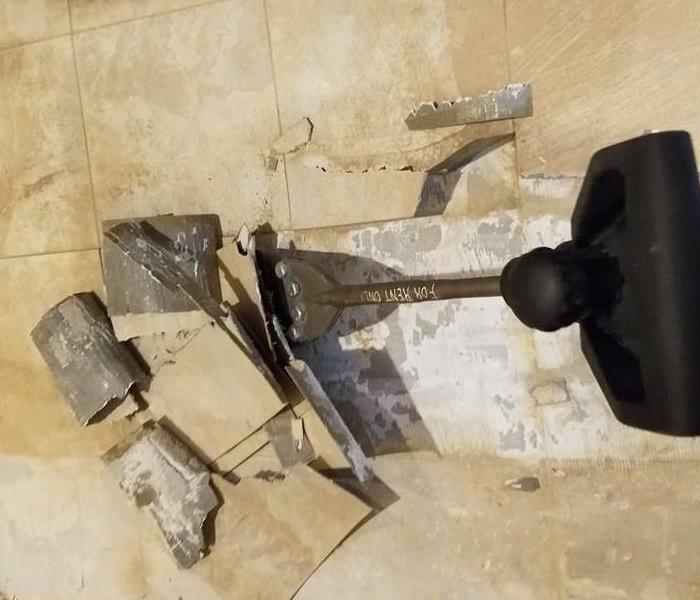 Not only do you need SERVPRO to extract the water and dry the area completely, we also will in some cases have to remove dry wall. 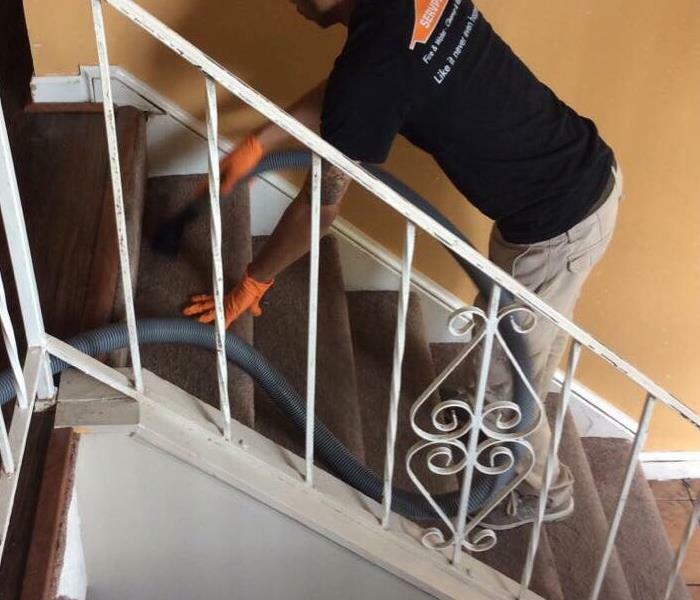 We do this so that we can ensure the area is completely dry and we can prevent mold growth. SERVPRO is here to walk you through step by step of the process and try to make it as easy as possible. Drying your home properly is very important after a storm. There is nothing worse then having to relive the damage over and over again because your home was not dried properly. Call SERVPRO to make it "Like it never even happened." When a storm hits it can cause all sorts of damage within a home or business. 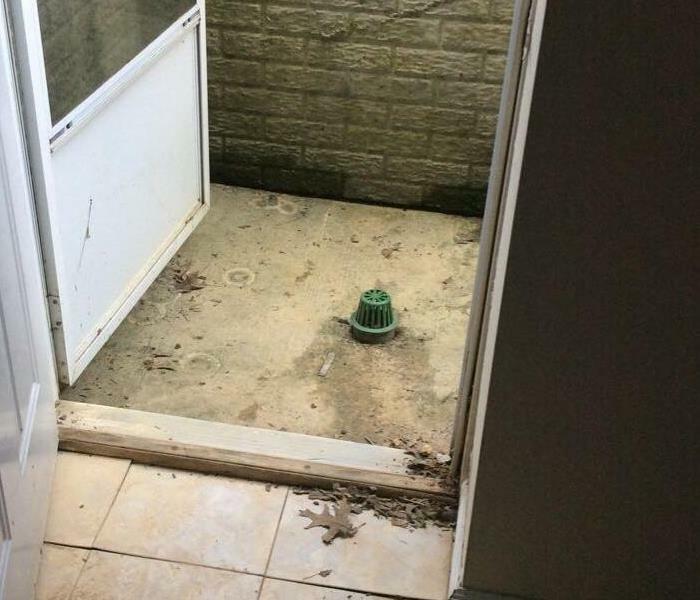 We urge people to pay attention to how your drainage system is structured as well as your door ways and low lying entrances. Fire Damage affects areas throughout your home or business because of the smoke and soot. 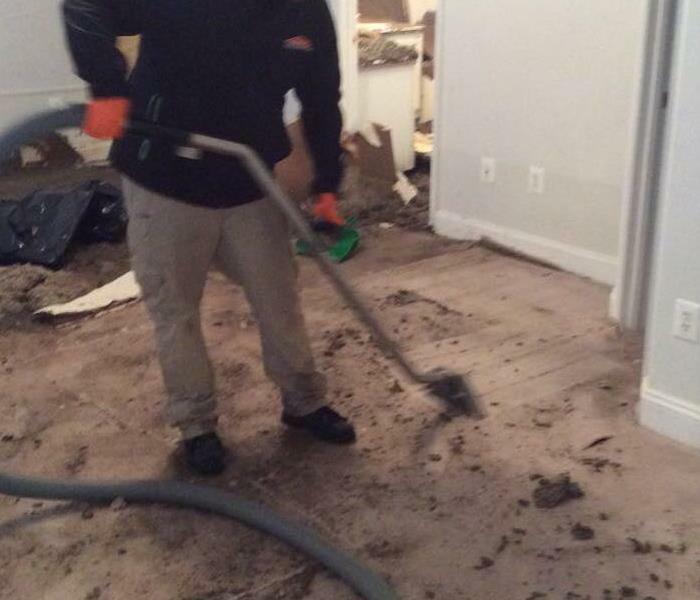 SERVPRO not only handles the directly affected areas we handle ALL areas. proper cleaning after a fire allows for other contractors to begin repairing your home to tip top shape. 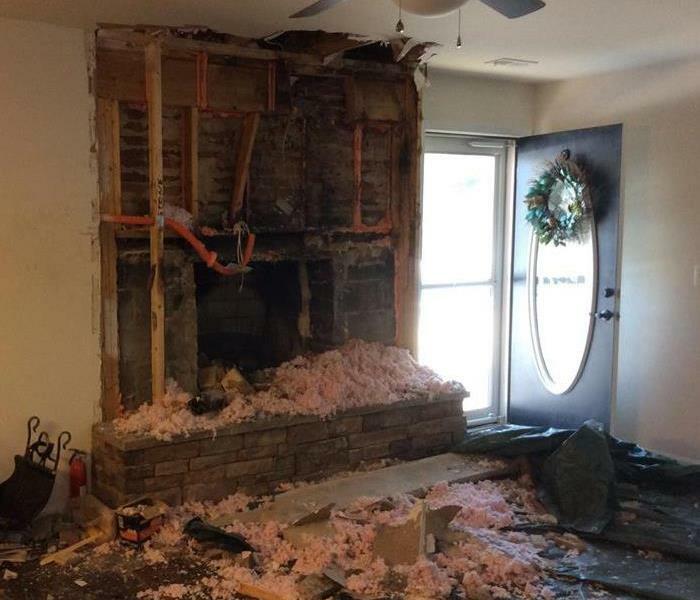 Though chimneys are meant to contain fires to heat your home and create a beautiful ambiance, they can be dangerous. Fire safety is very important when you have a fire place in your home and should be discussed frequently. Part of what SERVPRO provides is not just working the DIRECTLY affected area but ALL affected areas. SERVPRO is dedicated to helping you restore your home or business after a disaster. 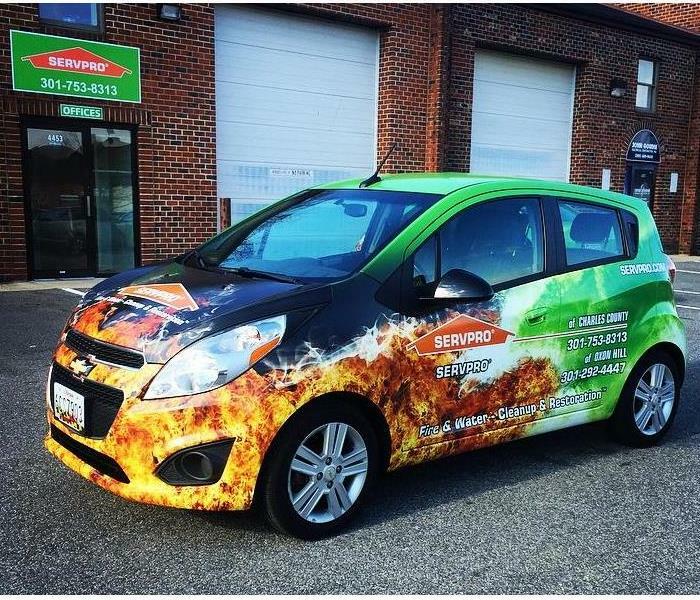 SERVPRO is here to make it "Like it never even happened." There was a leaky window that just happened to be above an air vent on the wall of a beautiful home. 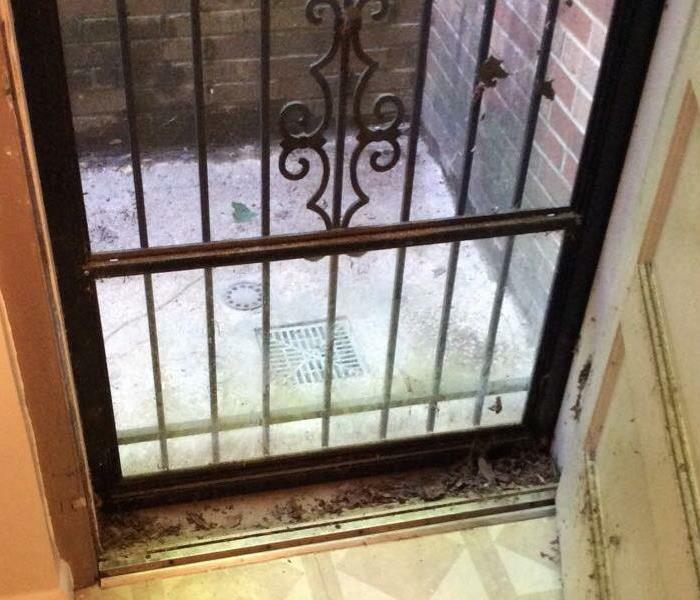 The window leaked water straight down into the air vent causing mold growth. 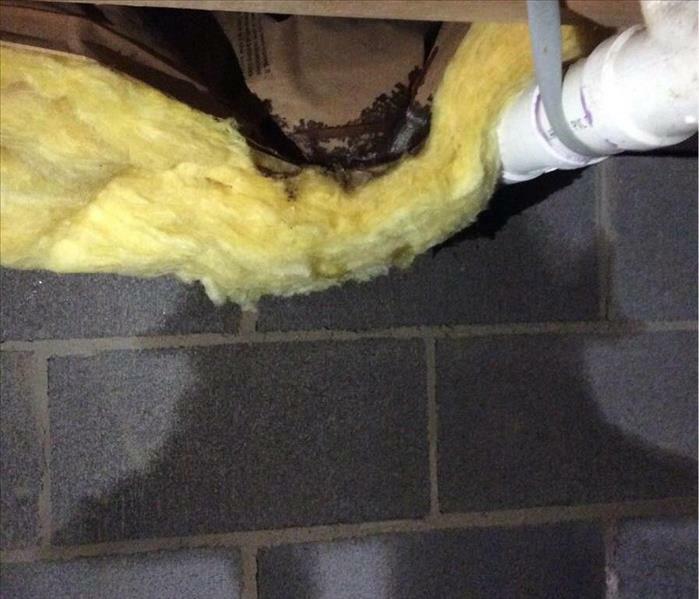 When you have any water leaks near ventilation please consult with a professional! Just when you think you have fixed the water damage and everything is dry and clear.... MOLD! It is very important to make sure anytime there is a water damage event you have a professional come out and assess the situation. 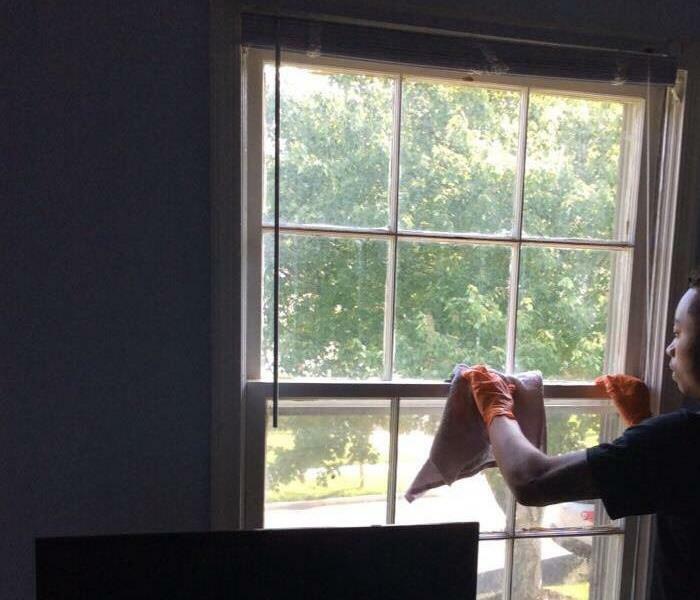 Here at SERVPRO of Charles County we provide free estimates to make sure you are getting the help you need. 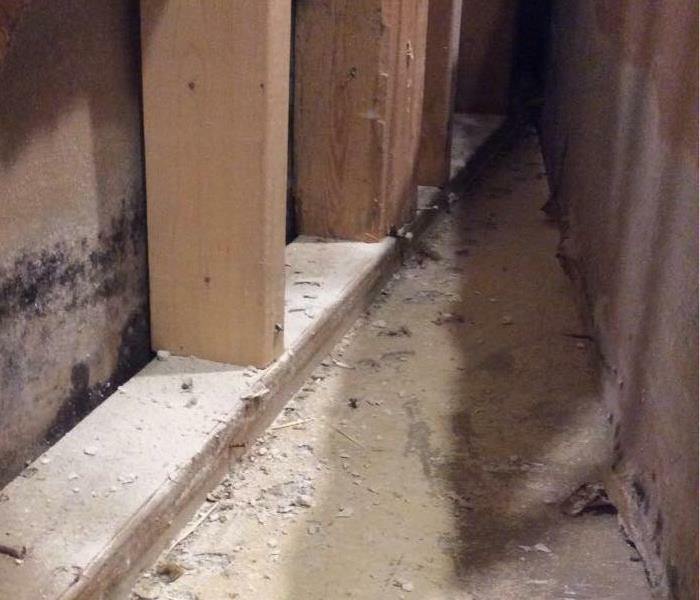 Mold can happen right under your nose. 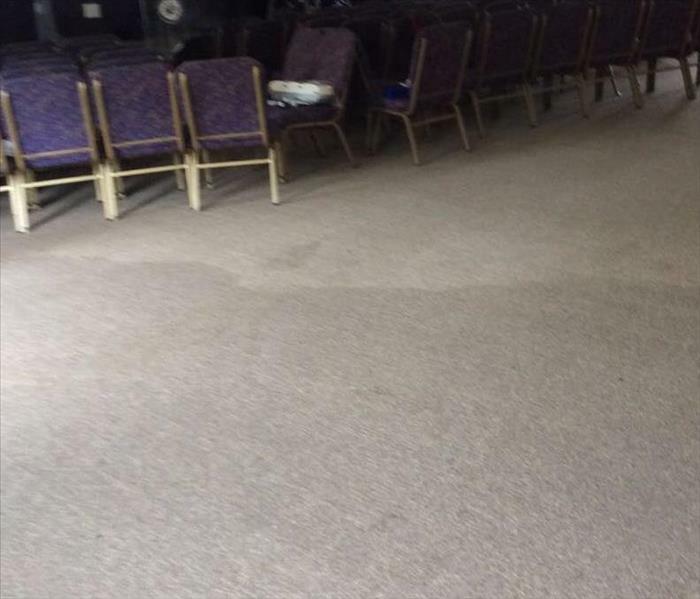 You have water damage on your carpet and you think you have treated the problem and the carpet is dry.... wrong. Sometimes the carpet will feel dry on the surface but below it is still wet. This environment can produce mold before you know it! 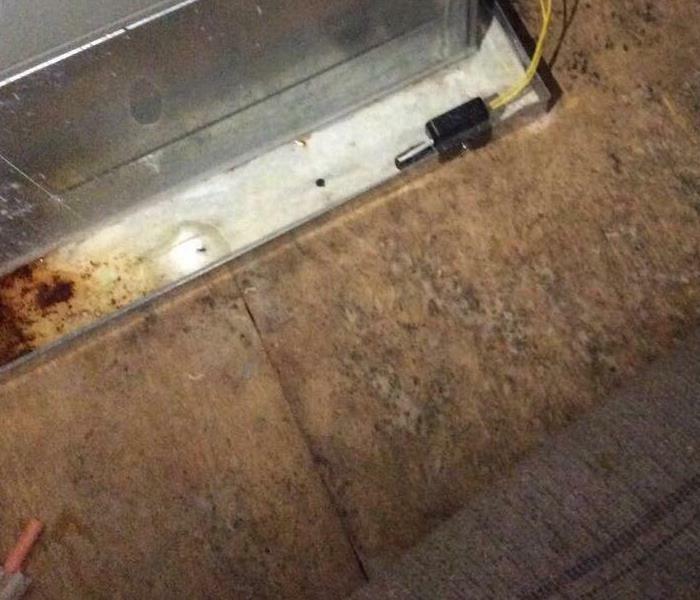 Mold can happen right under your nose. 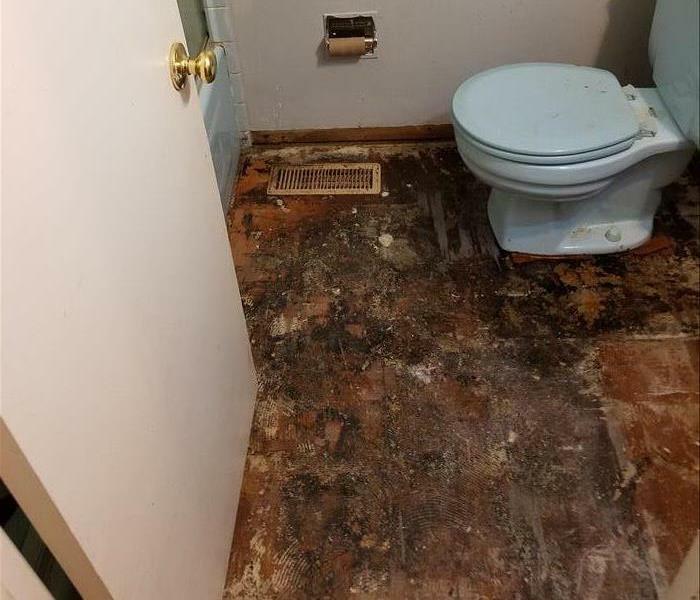 You don't need a major water event to cause moisture for mold. You can have simple but consistent condensation and that in the right environment could produce Mold spores. Be aware of moisture and make sure it is treated properly. This is an image of the additional damage the Hot water heater caused for this local business. 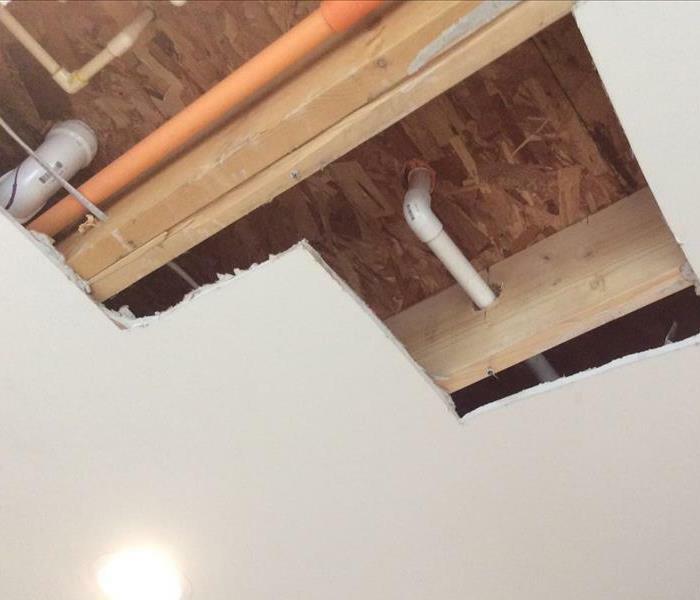 The water seeped from the utility closet all the way to the main area of this establishment. 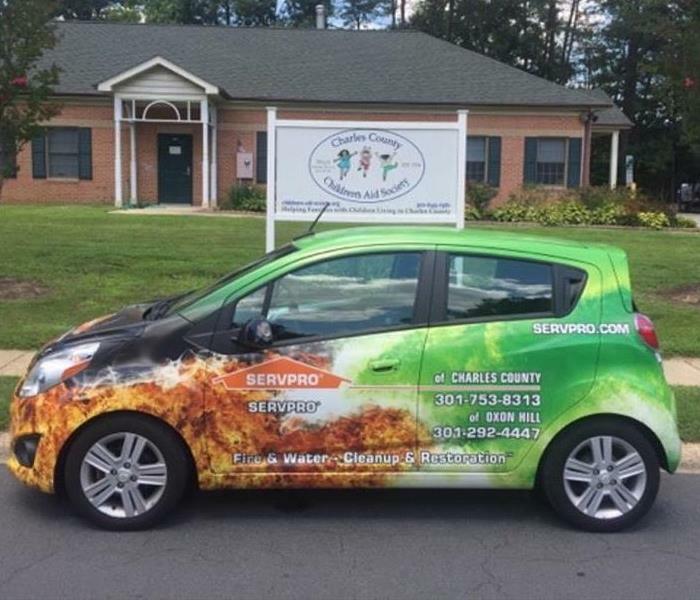 Something so small can cause BIG damage, that's why you need SERVPRO on your side. 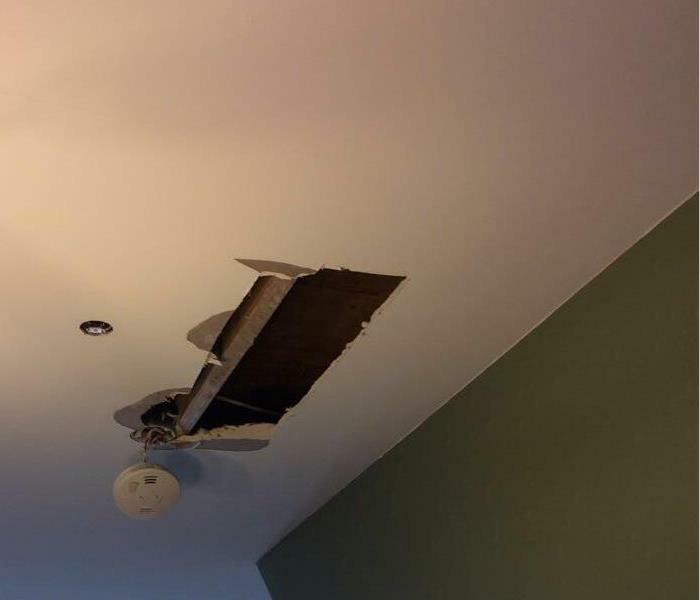 Water damage can be caused by a multitude of different things and this is a major culprit! 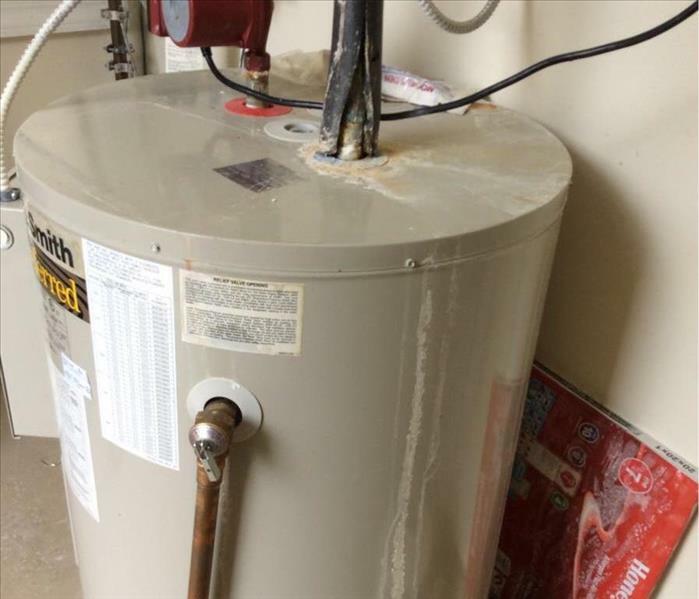 HOT WATER HEATER HORROR! 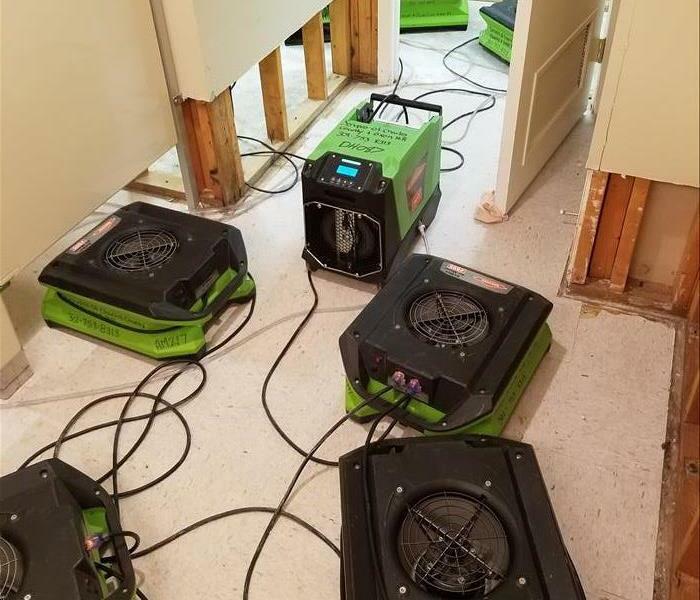 This business was flooded and SERVPRO came to the rescue and made it "Like it never even happened." After water damage it is very important to not only extract all the water but to also completely DRY the affected areas. Properly Extracting and Drying the area will help prevent MOLD growth and future issues. 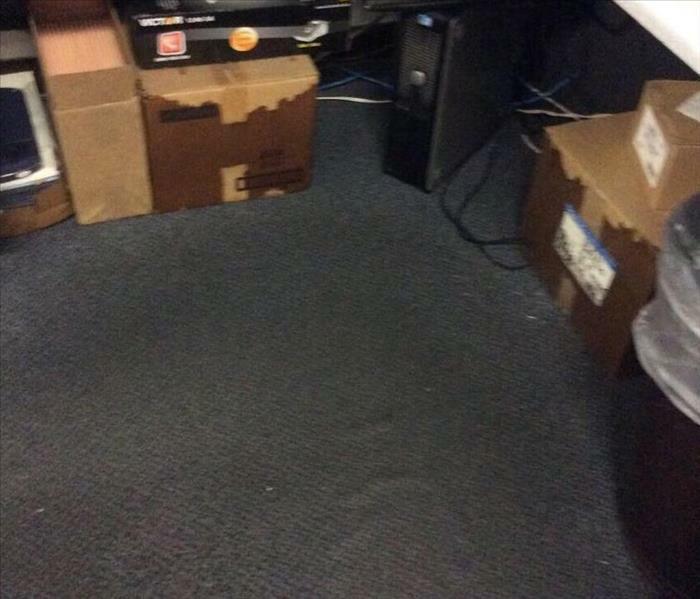 This is what water damage can do to your business. 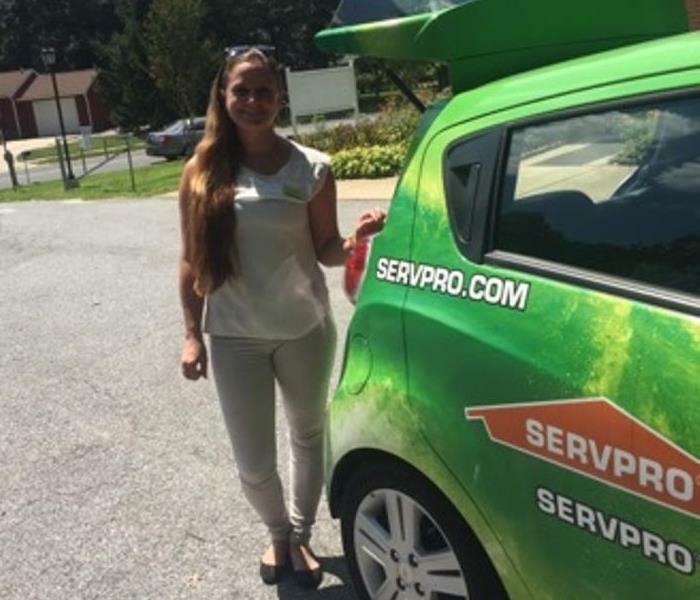 Calling SERVPRO immediately can reduce the time that you are out of business. We will come out and begin working to get you back to work. We also ensure that water extraction and drying is completed correctly to prevent the possibility of MOLD growth! Helping the Charles County Humane Society with a Biohazard job 2017. Animals are just as important as the people we serve. It takes one small gesture to start a movement! 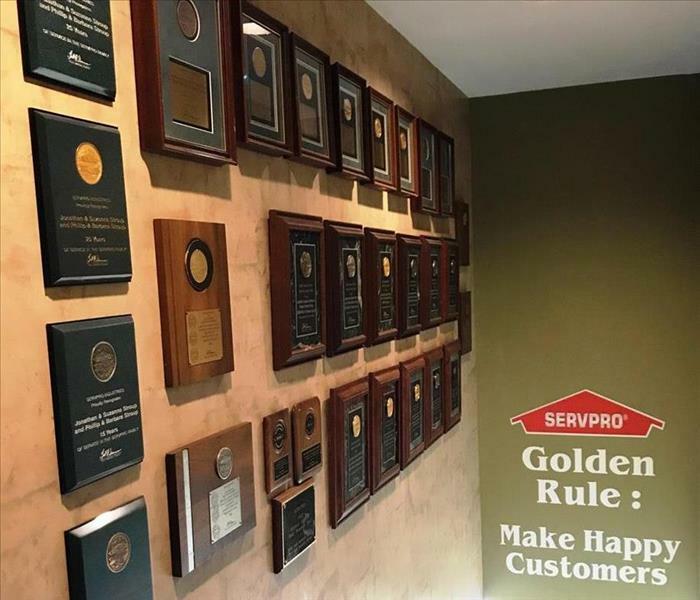 Everyday at SERVPRO we are reminded that we are here to SERV our customers with the BEST attitudes and high quality work. Our Marketing SPARK! When you see us honk and waive! This is our first SPARK on the road and we love our little buggie! We will have SPARK 2 on the road soon! We make it a point to not only SERV our customers but SERV our community. Back to school drive 2017 was a complete success! Kasey is all smiles delivering school supplies to The Children's Aid Society. This is definitely a highlight of our year in 2017. There is nothing better than helping the community! The genuine satisfaction that comes from assisting our community is written on our faces.